The EZOWare Bathroom Spacesaver fits perfectly over standard toilet tanks to create a fully functional open shelf system for bathroom organization and storage needs. The 3-tier shelves can store a variety of personal care, beauty essentials, or decorative items. Keep everything neat, organized, and easily accessible in the bathroom for peace of mind when getting ready or ending the day. The 3 fully functional open shelves are perfect to store and access items. Modern wire frame design for clean, minimalistic, and subtle lines. You can even utilize some decorative baskets, bins, boxes, or containers to further organize and match bathroom decor. Each shelf supports up to 11lbs load weight. Solid metal construction with non-slip floor end caps that will not scratch or scuff tiles and floorboards. Powder coated for water and moisture resistance. Simply follow the included instructions. Requires the use of a philips screwdriver and a 1/4 drill bit if mounting to the wall. Dimensions: 22.8 x 9.6 x 64.6 inches (58 x 24.5 x 164). Maximum Supported Load Weight (per shelf): 11lbs (5KG). Assembly required. Optional wall mount anchor holes, please consider anchoring it into the wall depending on use and preference. Clear the Bathroom Clutter: EZOWare Bathroom Spacesaver offers a decorative storage rack solution to help declutter bathroom spaces and organize bath and beauty essentials. 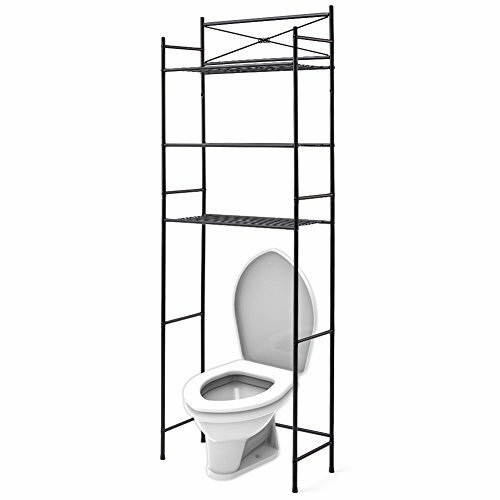 An easy to assemble storage rack designed to fit perfectly over standard toilet tanks. Sturdy & Decorative Design: Beautiful modern wire frame decorative with cross design. Black powder coated rust resistant finish for darker bathroom decor. Fully constructed of durable & sturdy metal for long lasting use. 3-Tier Shelves: Three functional open shelves that can hold 11lbs (per shelf). A great way to showcase and display storage canisters, containers, baskets, decorative inspirational reminders, framed photos, knick-knacks, or other home decor accessories. Accessible Storage: An easy way to create utilizable storage - perfect to store towels, bath & beauty essentials, personal care items, hair care products, brushes, blow dryers, hair flat / curling irons, candles, creams, lotions and much more. Assembly required. Maximum Supported Load Weight (per shelf): 11lbs (5KG). Dimensions: 22.8 x 9.6 x 64.6 inches (58 x 24.5 x 164). Distance Between Tiers: 10.4inches. Material: Metal. Wall mount anchor holes for best stability, please consider anchoring it into the wall depending on use and preference.